The French version of the pamphlet is now available. It is provided in U.S. Letter and A4 formats. Thanks to Maryline Chauvet, Valéry Giroux, and Marc Vincent for doing this translation. Please also remember that we have a complete mirror site in French that was translated by Valéry Giroux. We are gratified by the many, many messages we are getting from all over the world from advocates who find the pamphlet to be of assistance in their advocacy. This morning, I received a copy of a press release concerning the arrest and detention of Martin Balluch and other animal advocates in Austria. These advocates are apparently being held without any formal charges being filed against them. I have also read the Amnesty International statement that is translated on the website of Balluch’s organization. Amnesty International expresses concern about the lack of specificity of the search warrants, the manner in which the warrants were executed, the fact that the accused are not being fully informed of the evidence against them or being given access to their counsel, and the use of statutes intended to address organized crime, which risks criminalizing or chilling the legitimate and peaceful expression of protected speech and threatens freedom of association. I have absolutely no idea whether there is any evidence to support these charges. And I have been very clear for many years now that I oppose all violence and regard the principle of Ahimsa as the foundation for the abolitionist movement. But it does not matter what Balluch and the others are accused of. They, like everyone accused of criminal wrongdoing, are entitled to know with specificity the charges against them and to know what evidence exists to support those charges; they are entitled to assistance of counsel; they are entitled not to have the execution of a search warrant be an occasion for harassment; and they are entitled not to have their legitimate and legal activities disrupted by the overreaching use of organized crime statutes. I find it very difficult to believe Balluch’s claim that the Austrian government is persecuting him and the others because of their role in campaigning for Austrian animal welfare laws. These laws are hardly a cause for alarm by anyone. As I discussed in an earlier essay, the Austrian laws, like welfare laws generally, further entrench animal exploitation and do nothing to eradicate the property status of animals. But that is beside the point. If the Austrian authorities have evidence of criminal wrongdoing, they should file formal charges and initiate a public and transparent prosecution. If they do not have evidence, then they should release those being held. I have been a lawyer for almost 30 years and I have represented many individuals, including many animal advocates, who have been harassed by the authorities. I have also taught Criminal Law and Criminal Procedure for many years. I fully understand how the weight of the criminal process can be wielded by governments. It is very disturbing to see liberal democracies that supposedly celebrate “the rule of law” routinely ignore it. This is an example. Unfortunately, it is one of many. Poor Margaret Mead must not merely be rolling over in her grave; she must be spinning at high speed. 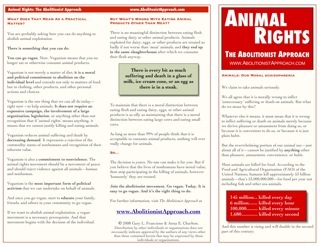 http://www.abolitionistapproach.com/wp-content/uploads/2015/09/aa_logo.png 0 0 Gary L. Francione http://www.abolitionistapproach.com/wp-content/uploads/2015/09/aa_logo.png Gary L. Francione2008-06-02 13:58:152008-06-02 13:58:15PETA and KFC: "no differences of opinion about how animals should be treated"
Martin Balluch, an Austrian animal advocate and president of the Association Against Animal Factories in Austria, is circulating an essay that he wrote and that he characterized to me as opening a “very new approach” to the rights/welfare debate. Balluch’s essay is long and, at places, convoluted, but the basic thesis is really quite simple. So what is the “very new approach” that Balluch proposes? He argues that we should support welfarist reform. Balluch argues that “it is at least possible” that welfarist regulation will eventually lead to abolition on both an individual and social level. That is, supporting animal welfare reform will, as a psychological matter, lead the individual toward veganism and will, as a political matter, cause the society to move toward abolition. In short, Balluch is not proposing a “very new approach” at all. 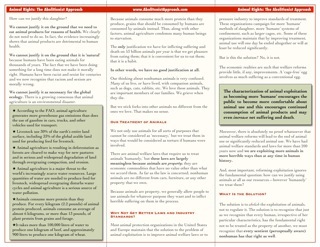 http://www.abolitionistapproach.com/wp-content/uploads/2015/09/aa_logo.png 0 0 Gary L. Francione http://www.abolitionistapproach.com/wp-content/uploads/2015/09/aa_logo.png Gary L. Francione2008-04-09 17:39:522008-04-09 17:39:52A "Very New Approach" or Just More New Welfarism? On January 8, 2008, the European Commission rejected calls that it postpone its Directive calling for a “ban” on the conventional battery-cage, which is scheduled to go into effect in 2012 (after being first announced in 1999). According to the Directive, producers will have the choice to go “free-range,” “barn” (known as “cage-free” in the U.S.) or to use “enriched” cages where stocking densities are lower and that must have a nest, litter, perch and clawing board. And the welfarists are, as you would predict, just as excited as they could be, although some at least had the good grace to reveal a small hint of the skepticism that is warranted.